NEW YORK — I’ve never much cared for the phrase “The Chosen People.” It just strikes me as a little braggy. My preferred nickname has always been “People of the Book.” It sounds serious and studious, and lends itself to the type of interpretation you might find — with lengthy footnotes — in a very important book. I’d like to think that early 20th century Polish-Jewish historian Emanuel Ringelblum had this double-meaning in mind when he first implored his colleagues, likewise trapped in the Warsaw Ghetto, to “get everything down on paper.” But as the remarkable film “Who Will Write Our History” shows, levity wasn’t exactly his top priority. Ringleblum’s group, code-named “Oyneg Shabes” (Enjoyment of Sabbath), was a collection of writers, artists, social critics, economists, teachers, rabbis, statisticians and others that lived in (or were brought to) the Warsaw Ghetto during World War II. Ringelblum recognized the enormity of what was happening and felt the best thing he could do was to keep a record — a true record — and hope that some day it could be of use to mankind. “No one appointed him,” historian Samuel D. Kassow says in this mesmerizing film that is half-documentary/half-reenactment. He just did it. Ringelblum was working at the Jewish Joint Distribution Committee, the last remaining infrastructure for the enormous Jewish community in Warsaw prior to and during the time of the ghetto. There he was able to collect grand scale information concerning the movements of people, but also smaller stories of individual indignities that could easily slip through the cracks. Combined they form the true picture of Nazi atrocities and institutionalized anti-Semitism. The importance of this material is evident. Without it, almost everything recorded about the Warsaw Ghetto came from the top down. German cameramen took German pictures. Propaganda films (included in this movie) positioned the Nazis as saviors to a Polish populace infested with conniving, thieving, dirty, lice-ridden Jews. The materials collected for the archive are reports direct from beneath the boot of German abuse, and recorded in real time. What sticks with me are the details. A snapshot of women forced to remove their underwear to use as rags to clean the street, then told to put them back on in the freezing cold is something that can only come from a witness, and it’s the type of thing that could, over time, dissolve into a more generic description (“they were terrible to us”) by someone who is trying to forget. Also shocking, was listening to the written reactions to the first reports of mass murders happening in camps outside the city. 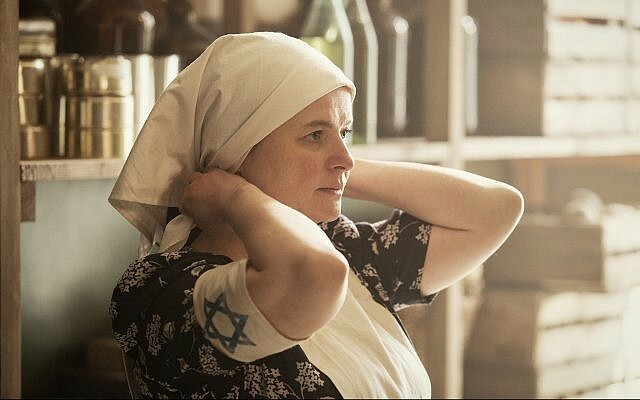 There is also raw, true emotion of the kind that maybe seems like a hiccup in the overall narrative, such as the Jewish anger against the Jewish police who enforced German rules, even with a gun pointed at their head. The sequences in this film set during the mass deportation come in a fury; it is the 1940s version of “live blogging,” a camera-eye depiction from the middle of a nightmare. There are also moments of reflection, even poetry. “It’s like a Hollywood movie out there, all you see are stars,” one journalist mused in reference to the Star of David armbands Jews were forced to wear. One of Ringelblum’s aces was Rachel Auerbach, who would later hold a key position at Yad Vashem. She worked in the ghetto soup kitchen, where dilemmas such as “nourish one starving person enough that they might survive, or stretch the meager rations among 10 to string dying people along for another half-day?” were commonplace. The firsthand specificity from the archive makes seemingly obvious points that, unless you lived through it, you might not think about. As an example, Ringleblum was lucky enough to live in the area that eventually became the ghetto. As such, he did not have to move — and was able to use his residence as a home base. People who came in from elsewhere in the city, or from the countryside, were frequently not given enough time to collect things of value. With nothing to sell for food, they were often the first to die. That this movie exists at all is something of a miracle. All but three of the Oyneg Shabes group were killed, and only two knew where to look for the materials. The first cache was found in the Warsaw rubble right after the war. The second in 1950. There’s a third still out there somewhere, believed to be under the Chinese Embassy. You’d think the Polish government would figure out the logistics to look for it, especially considering that the film ends with a card stating that only three document collections from Poland are in UNESCO’s Memory of the World collection: the music of Chopin, the scientific work of Copernicus and the Oyneg Shabes Archive. Interestingly enough, the same month “Who Will Write Our History” makes its US debut (and also at New York’s Quad Cinemas), there’s another film with similar themes and technique. 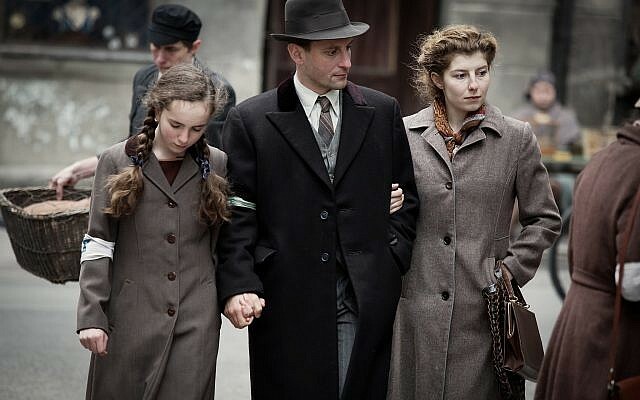 Claus Räfle’s “The Invisibles” moves from Warsaw to Berlin, to detail the lives of four individuals who hid in plain sight during the entirety of the war. It’s another example of how individuals are easily overwhelmed by outside forces. There are plenty of Germans who want to help their Jewish neighbors, but each have different breaking points for the amount of risk they can take. One clever Jew uses a list of apartments known to have spare rooms for young men about to get “called up.” He bounces from place to place until he can find something more secure. On the other side of this, a woman with safe shelter stays as long as she can until her host is discovered by the agency that assigns rooms for those that have been bombed-out. After this she ends up a servant in a Nazi officer’s home, never quite sure if he knows her true identity. Unfortunately, Räfle’s film lacks the focus of Grossman’s (and is extremely repetitive) but is most interesting, again, when it gets into the minutiae of just how someone could survive the war in a city that Joseph Goebbels boasted was finally Judenrein. One woman, Hanni Levy, found safe houses when she could, but much of the time she did something so obvious it sounds like a joke. She just … walked around. For months at a time, with dyed blonde hair and no yellow star on her clothing, she roamed the Berlin streets, ducked into movie theaters, stayed in parks, kept her head down and maintained hope. Levi is still with us at age 94, and living in Germany. So for her, at least, hope and luck somehow were enough. Neither “The Invisibles” nor “Who Will Write Our History” are naive enough to suggest that, most people would find such a miracle. “Who Will Write Our History” will be screening in these North American, European and Israeli cinemas starting January 18. “The Invisibles” will show at New York City’s Quad Cinemas and Landmark 57 West, and at Los Angeles’ Royal starting January 25.